Hi readers!! I have already arrived safely in Hanoi. Currently staying in one of the hotels located in the Old Quarter in Hanoi. Anyways, it took a while for my luggage to arrive at the bag carousel so I was a little worried that it won't arrive, but it finally did. There was a little mishap, and I actually booked the wrong dates for the hotel... (LOL). Fortunately the administrator managed to find a room in the same hotel. The room rates I am currently paying is USD15 (first night a Queen size room), USD20 (second night) and USD23 (family room). Our private car fare from the airport was USD15 as charged by the hotel. When we asked around at the airport the quote given by one of the agents was USD30, which was a bit preposterously expensive. Breakfast is at USD3 which includes a main meal, a dessert and a hot drink. So it was torrential rain from the moment before we even touched down. Our luggage bags were actually wet when I retrieved them from the bag carousel. Anyways, I am going for a tour tomorrow in the city that cost USD18. I actually bought a ticket for a Water Puppet for 5 USD (100,000 VDN) but I think that's going to burn because it clashes with the tour tomorrow. Yeah, I bought it first.. nevermind to make a long story short. The food here so far hasn't been exactly all that cheap as you would think. its about USD1 to about 21,000VDN. A meal cost about 30-35,000VDN which makes it about USD1.50 (RM5 ish). So I think the price is close to Malaysian standards anyways. Its been raining all day... can't stand it. Hope it will be a sunny day tomorrow morning when we go on our tour. To pamper myself, I used all my Sothys products and my lovely body products I have been collecting all this while. 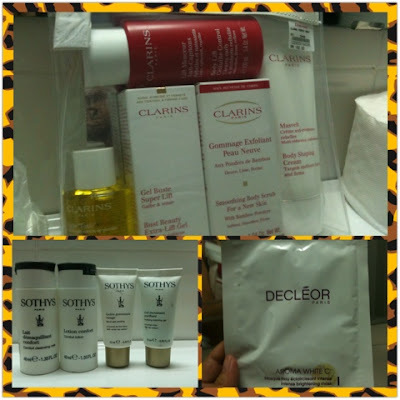 The Clarins deluxe body set consists of a couple of full sized body care products for Rm180 which includes a deluxe sized plant treatment body oil, body shaping cream, cellulite serum as well as deluxe sized body scrub.It smells just heavenly, and I definitely hope it will do its job!